Can anyone itdentify the remaining figs in this lot? I know what the ones with the "X"s are. The seller listed the lot as cereal premiums but obviously that is not the case (at least for some of them). I can post better pics when I receive them if needed. Edited by Liz Sherman, 19 February 2008 - 09:29 AM. The grey motor-looking guys are from Ghostbusters. They went in the trunk of a yellow convertable that morphed into a preying mantis thing. The blue guy is also from Ghostbusters, and I think it's from the running version of a purple blob-like guy. The black think looks like an alien from the Alien series of movies, but I could be completely wrong. I'm not even a tenth as good at spotting stuff as the other people on this board. The blue one is as I thought. 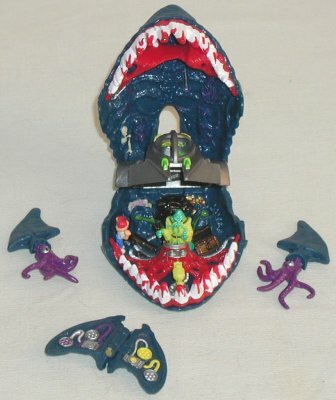 The two squids with fins for heads are from Mighty Max. 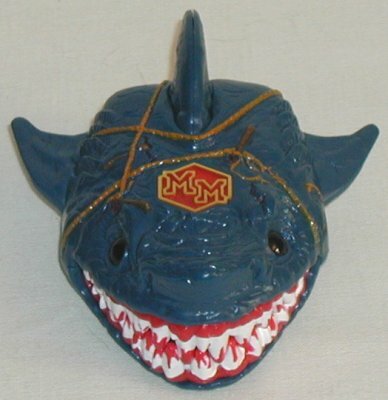 They are from the Series 2 Doom Zone "Mighty Max Caught by the Man Eater." I actually had this set back in the day. I used to love Mighty Max. This thread got me to look a bunch of them. My favorite was the Wolfship 7 playset. I knew it! There's always those noticeable "things that look like other things" in those sets, and I suspected as much in my post... which didn't go through when I tried posting it. Like I was trying to say, mimo was right. The black thing is an accessory to the Alien Queen, from Kenner's Aliens toyline. It's supposed to be a Queen Chestburster, I believe. The little blue snake dude with the hat, and the orange creature with the long, skinny legs might be TMNT companion figs -- especially since there are so many TMNT companion figs in the lot. So to summarize what I've shared: I have no clue what you've got. Edited by Soupie, 19 February 2008 - 02:27 PM. But seriously, I had the same thought about the blue guy. I'll have to take a closer look when I actually get them. Edited by Liz Sherman, 19 February 2008 - 02:39 PM. Edited by matthewf1tz, 19 February 2008 - 02:48 PM. I've got that TMNT red bird - there was a military-themed bunch of Turtles, and it came with Navy Mike. Mikey's seen better days though. Stupid legs snapping off. The two green snakes with the human-shaped heads came with this big castle playset i used to have when i was little. The castle itself was a big metal rectangle that folded up and had a handle for carrying it. It came with a bunch of different knights, some blue wizards, these snakes, catapults that shot tiny plastic rocks, and some other stuff. I believe one side of the castle had a drawbridge that could be pulled up via little tiny chains. I can't remember exactly what it was called or who made it though, sorry. I managed to identify the brown bunny creature from the markings on the bottom. It is an Alpha Critter (or Alpha Pet) from a childrens book series of the same name. It is the letter X.
I still haven't idenified the orange guy and the there was also a brown dinosaur creature that wasn't pictured. They both just say Hong Kong on them and are very cheap plastic. The cool thing about the brown one is that is actaully stands on its feet without needing to lean on the tail (pretty rare in such a cheap figure). The orange one has very strange feet...both have three "toes" but one faces the side and one faces the front. Then there's the blue snake guy. I was really hoping that he was a TMNT companion fig but I am not so sure. He is the same size and material but he has a peg on his back (like he is supposed to hook onto something). None of the TMNT figs that I have are like that. Edited by Liz Sherman, 28 February 2008 - 11:55 PM. Actually a few of the TMNT figures I have are like that -- that is, the weapons and "clothing" they have are made of animals that they are supposed to wear. I just got the Gorilla character and he has an ammo belt that is actually a big python and a machine gun that has a lizard attached to it. So the fact that your blue guy has a peg on him like that doesn't rule him out from being a TMNT figgy. He also seems to be at the perfect scale for TMNT figures. I'm sure someone's bound to recognize him, and I'll keep searching myself. The orange guy would seem to be a bootleg of the little rubbery brown figure I have. Mine has 3 japanese (I think) characters followed by A G and then another line of 7 characters below that. Unfortunately I can't get a good pix of the characters. Edited by gilgar, 02 March 2008 - 08:44 PM. Maybe this will help someone ID the little orange guy, The yellow guy in this picture has the same markings as the brown one which looks like your orange figure. I spent nearly two hours this weekend looking through TMNT figure archives and other images of the toyline trying to place that blue snake guy. I'd bet money based on the sculpt style that he's a TMNT companion figure, but i can't find a picture of him anywhere. It's absolutely killing me. Gilgar - Thanks for the pics! Hopefully that will help someone solve this mystery. 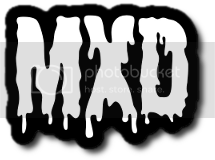 Scumdogg - I too have been scouring TMNT archives and ebay to no avail. Good luck on your hunt!! I can't identify the snake guy, but I was so jazzed that I could actually spot something before Liz Sherman received the lot. I have that same alphabet critter, plus P and U...three letters that spell nothing in the English language. Anyone want to see pics? Its too bad though cuz this seems like a line I could really get into. Edited by Liz Sherman, 07 March 2008 - 03:35 AM. What price would be fair for these things? Anybody want to take a crack at it? I know they were sold in KB toy stores in California over twenty years ago, because that's when I bought mine. Edited by shocklord, 10 March 2008 - 04:17 AM. Bump on this blue guy. Has anyone identified it yet? (I should add it to Toypedia if it hasn't been.) Seriously, this figure does not appear to be a bootleg, just a legit figgy that deserves to be identified. I had hoped that you had identified this little guy, I've got him in the back of my mind and hope that one day somebody knows who this guy is .